A confused action romance that cannot decide if it's meant for anime fans or an uninvested tween audience. Marketed as a James Cameron blockbuster, Alita: Battle Angel was in fact directed by Sin City franchise-leader Robert Rodriguez and stars Rosa Salazar as Alita and Christoff Waltz as her ‘creator’ of sorts, Dr Ido. Ido discovers Alita’s ‘core’ on a trash heap and revives her, leading to the events of the film, a few of which revolve around a cyberpunk version of Roller derby, a tween-age love story, a violent gang of bounty hunters, and somewhere amongst those tangled threads of narrative lies Alita’s journey of discovering her true identity. The downfall of Alita: Battle Angel lies in the multiple threads it tries to sustain, and in attempting to meet all of these expectations the resulting film is confused, both in genre, tone, and narrative. The film begins with Alita’s creation where she is established as a young girl, the air of innocence surrounding her endearing. Her love interest, Hugo (Keean Johnson), is introduced almost immediately, and the film descends into a cringeworthy romance flick that happens to take place in a post-apocalyptic dystopian cyberpunk city. From there, the confusion sets in as the film shifts between quite graphic violence, conspiracy plots and action set pieces of cybersport ‘Motorball’. Secondary characters are introduced throughout, some of whom their arc could fill an entire feature themselves, yet are discarded quickly, their threads left hanging or in tangled knots. The combination of teen romance and graphic action set pieces leaves the tone of the film very unsettled and could possibly come from trying to meet audience expectations of a James Cameron film, a Robert Rodriguez film and of the original Manga on which the film is based. The attempts to combine and cram all of these aspects into one feature can also be seen reflected in the harsh, pointedly obvious script – perhaps an effort to ensure the audience can at least try to follow and invest in everything on screen. The most troubling aspect of the film perhaps is the underlying race and gender issues sitting beneath the polished surface; most notably of which includes Alita’s final purpose in the film to be a tool for which the men in her life can use to achieve their narrative goals. Further delving into the film could most definitely reveal many more issues that often accompany cross-culture adaptations, particularly one as westernised as Alita. Despite the flaws within the structure and flow of the film, the aesthetics themselves deliver in true Cameron style. The world-building as the basis for the jumbled plot and weak characters is done superbly, Alita herself housed in a stunningly designed cyber-suit, as well as the cyborg others featured who look similarly awesome – a mishmash of rust and chrome. Thankfully, the fluid and stylish action set-pieces offer respite from the bewilderment. In particular, the Motorball sequences are executed with flare, seamlessly shot and allowing Alita a platform to display the strength and power that should ultimately have been the core focus of the film from the beginning. 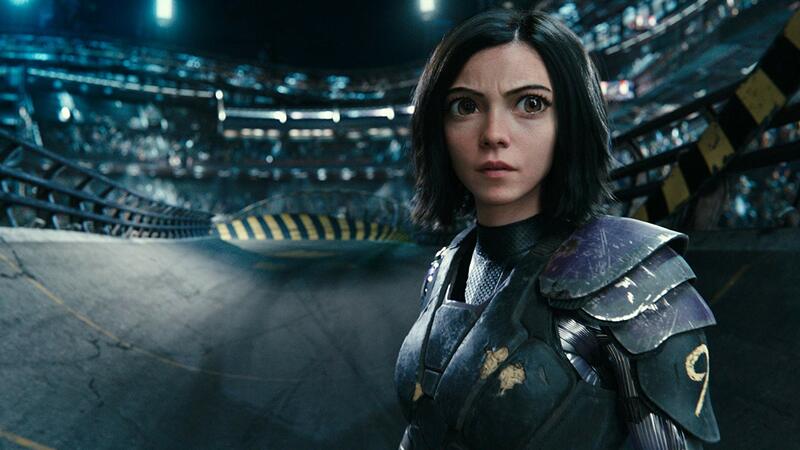 As dazzling as the visual effects and production design are, the weaknesses of Alita: Battle Angel overshadow the impact the film could have had. Tonally, plot-wise, and in terms of characters, it is distractingly all over the place, alienating viewers from its spectacularly constructed cyber-world. Alita: Battle Angel, directed by Robert Rodriguez, is distributed in the UK by 20th Century Fox, certificate 12A.